The 10th annual Best Translated Book Awards were announced this evening at The Folly in New York City. 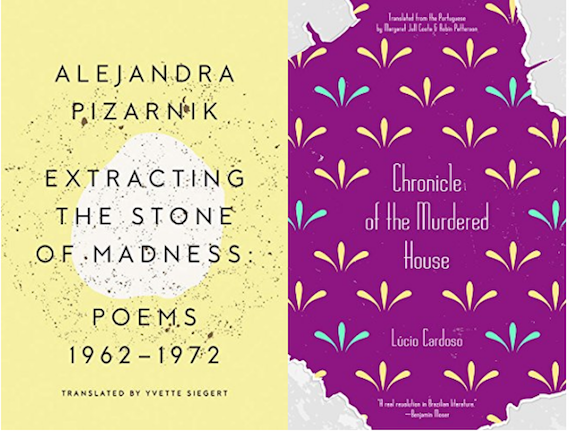 Lúcio Cardoso’s Chronicle of the Murdered House, translated from the Portuguese by Margaret Jull Costa and Robin Patterson, won for fiction, and Alejandra Pizarnik’s Extracting the Stone of Madness, translated by Yvette Siegert, won for poetry (read our review here). Extracting the Stone of Madness is the fourth collection of Alejandra Pizarnik’s to be translated by Yvette Siegert, but the first to win the Best Translated Book Award. It is published by New Directions — which has won the BTBA on three past occasions, twice for fiction, once for poetry — and collects all of Pizarnik’s middle and late works, including some posthumous pieces. Past winners of the fiction award include: Signs Preceding the End of the World by Yuri Herrera, translated from the Spanish by Lisa Dillman; The Last Lover by Can Xue, translated from the Chinese by Annelise Finegan Wasmoen; Seiobo There Below and Satantango, both by László Krasznahorkai, and translated from the Hungarian by Ottilie Mulzet and George Szirtes respectively; Stone Upon Stone by Wiesław Myśliwski, translated from the Polish by Bill Johnston; and The True Deceiver by Tove Jansson, translated from the Swedish by Thomas Teal. In terms of the poetry award, past winners include: Rilke Shake by Angélica Freitas, translated from the Portuguese by Hilary Kaplan; Diorama by Rocío Cerón, translated from the Spanish by Anna Rosenwong; The Guest in the Wood by Elisa Biagini, translated from the Italian by Diana Thow, Sarah Stickney, and Eugene Ostashevsky; Wheel with a Single Spoke by Nichita Stănescu, translated from the Romanian by Sean Cotter; and Spectacle & Pigsty by Kiwao Nomura, translated from the Japanese by Kyoko Yoshida and Forrest Gander. For more information, visit Three Percent, the BTBA site and Facebook page, and follow the award on Twitter. You may have heard. In a surprise upset, the Booker Prize was awarded to Alan Hollinghurst for Line of Beauty. Oddsmakers, literary professionals, and speculating bloggers all considered David Mitchell’s Cloud Atlas to be a lock, but the Booker, as is so often the case, proved too wily to predict. The award will lead to many newspaper write-ups (NYT reg req’d), and a big boost in sales, although, from the looks of things, I would expect relatively modest Vernon God Little numbers rather than blockbuster best seller list Life of Pi numbers. With the Booker overwith, all eyes turn towards the National Book Awards, which will be announced on November 17th. A look at the non-fiction finalists.Bookspotting on the ElI meant to link to this post from Conversational Reading a while ago as it really captures the particular afflictions of many book lovers. His first question caught my eye: “Do you surreptitiously observe what people are reading on public transit?” Anyone who has read this blog for a while knows that I have the odd habit of posting about the books I spot people reading during the course of my day. (Bookspotting I call it.) Some might find this odd, but I think it’s fascinating, and better than any newspaper article or bestseller list at seeing what books people are interested in. Sure you lots of people reading the bestsellers, but you also see a delightfully random sampling of the books that our fellow citizens bury their noses in each day. Some my find this to be an odd hobby, but I it manages to affirm my faith in civilization. Here are the three books that I noticed from my seat on the Red Line today: Song of Solomon by Toni Morrison (Morrison is an essential of American lit), The Devil in the White City by Erik Larson (I’d wager that this book has been a huge seller here in Chicago), and Love’s Labour’s Lost by William Shakespeare (I love seeing people casually reading Shakespeare on their way to work).